Removes most inks, including permanent marker, ballpoint pen, highlighter, stamp pad and fountain pen inks. Designed to work on hard surfaces, yet can be used safely on clothing and upholstery. Removes nail polish and correction fluid from clothing, dry-erase boards and countertops. Water-based. Application: Chairs; Floors; Tables; Walls; Applicable Material: Cement; Fiberglass; Metal; Plastic; Tile; Vinyl; Dirt Types: Ink; Scent: Neutral. 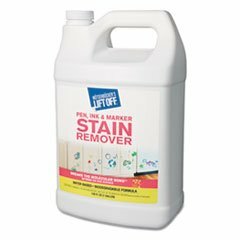 Removes nail polish and correction fluid from clothing, dry-erase boards and countertops. If you have any questions about this product by MOTSENBOCKER LIFT-OFF, contact us by completing and submitting the form below. If you are looking for a specif part number, please include it with your message.